Preamps are a fairly common piece of gear these days. However, BBE Acoustimax is anything but common. In fact, it is one of the best pedals and accessories you can get for an acoustic guitar. Today we are going to check it out closer and see what BBE has created. 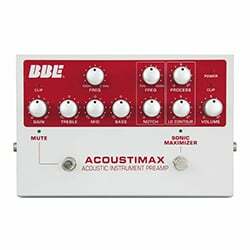 From an aesthetic point of view, BBE Acoustimax is about as simple as they come. It features an aluminum chassis with no special graphics or over the top finish applied. You could put this thing on a console in an industrial site and it would fit right in. In terms of actual features, you are looking at a three-band EQ with a semi parametric mid control, BBE’s awesome Sonic Maximizer and a whole lot more. BBE has applied over 40 of their patents to this preamp. This is why many consider BBE Acoustimax to be a whole different level compared to most other preamps on the market. In terms of I/O, you have a variety to choose from. There’s an FX loop port, line out, DI out and tuner out. On top of that, you get a pre/post switch, -12dB pad, phase shift and ground lift. The features we have listed above may give you an idea that BBE Acoustimax comes with a cluttered control panel. Fortunately, that is not the case. Controls are actually rather intuitive. BBE achieved this by using a fairly large chassis which has plenty of room for every knob, switch and button. Everything is labeled clearly, allowing you to quickly make adjustments on the fly should you need to. The back panel is the same. Looking at the actual knobs, you will see that they are divided into several clusters. First cluster from the left is the EQ. Next comes two secondary tone shaping clusters. One packs the Frequency and Notch knobs while other contains Process and LO Contour knob. Lastly, there’s the Volume knob. If you look at the bottom of the pedal, you will find a bypass switch right next to a Sonic Maximizer switch. When it comes to performance, BBE Acoustimax is a true workhorse preamp that just about does it all. The sound you get is a very warm but balanced one, with plenty of headroom to work with. The EQ that comes with the preamp is pretty accurate while that semi-parametric mid control does a lot towards dialing in some girth. BBE Acoustimax has proven to work flawlessly with just about any type of electronic or pickups you could have on your guitar. The Sonic Maximizer feature adds a whole new layer of flexibility to this already impressive preamp. Sonic Maximizer isn’t really something you would want to use directly on your guitar signal. It boosts your lower frequencies on account of your mids. However, when pushed through an amplifier, Sonic Maximizer can be a pretty powerful tool. Overall, BBE Acoustimax brings a very solid performance. As far as preamps go, BBE Acoustimax is at the very top with few other models from different brands. It has its own unique tone. The features that it brings to the table are performance oriented and don’t include things some would label as gimmicks. It’s a solid choice overall. 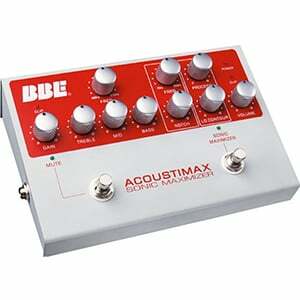 For more info about the BBE Acoustimax, click here.